I could not have had a more productive, fun, fulfilling, rewarding or prolific sewing year. I finished 26 tops, a record for me. My goal every year is the same, 12 finishes, boy did I surpass that. One goal for this year was to end the year with no UFO's and that's just what happened. 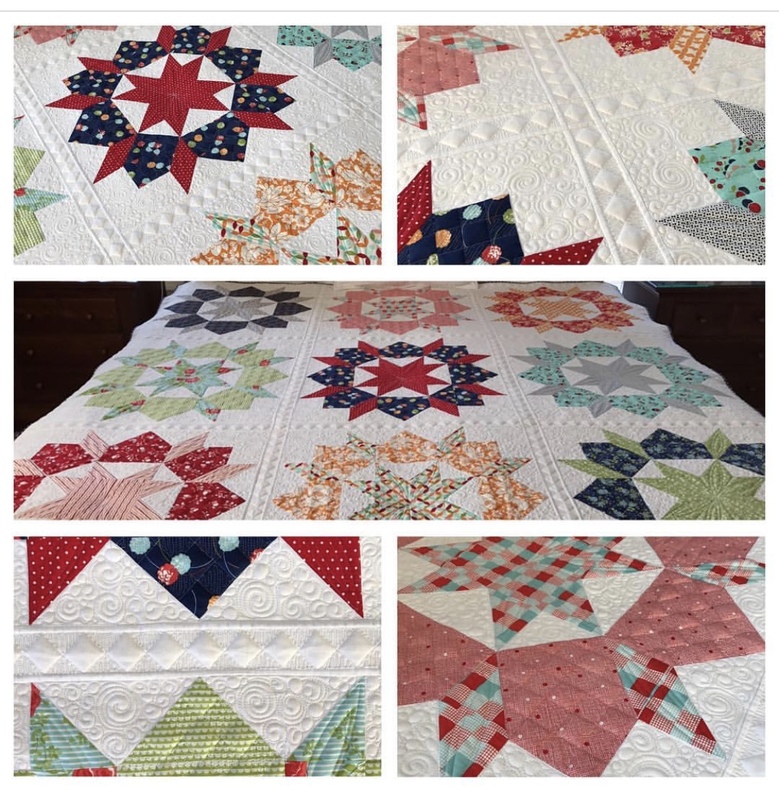 I finished Zipper (#196) and Ombre Star (#201) which I had started in 2016 in addition to finishing every quilt I started in 2017. I made two baby quilts, and got the cutest pics of babies enjoying them. Both these quilts found great new homes, and combined, raised over $7000 for worthy causes. I'm so happy I finally tackled that double wedding ring quilt goal that's been on my bucket list for ages, it's an even sweeter accomplishment since I absolutely love what I made. Great Big Peppermints # 217 - one of my top 5 for 2017. 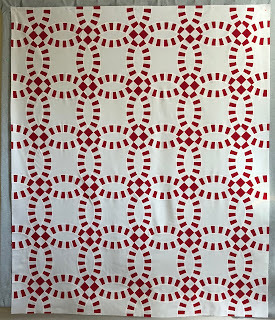 This also met my Red and White quilt goal, why make one red and white quilt when you can make two? Another 2017 Goal that I accomplished was finally using some of my stash of Carolyn Friendlander fabric. 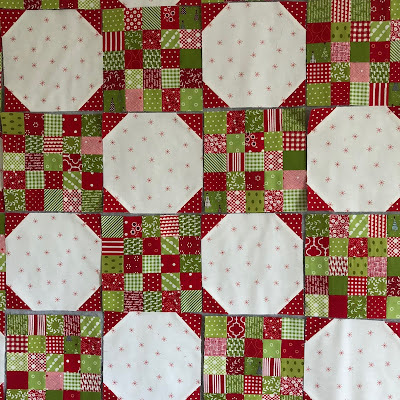 I ended up piecing two quilts using that fabric and have some left for something fun in 2018. This is the year instead of sticking to my quilting plan I stopped what I was doing and jumped on a couple of fun and easy social media bandwagon quilts, very un-Thema of me. 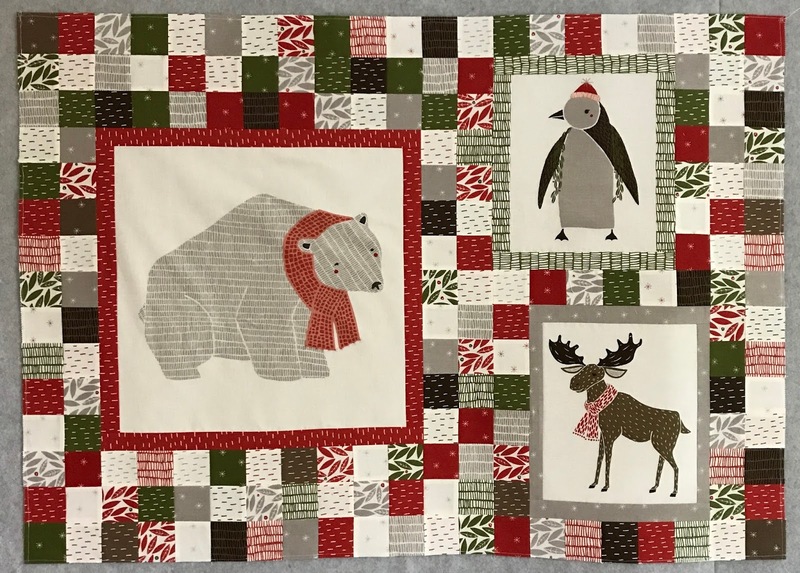 I intend to be more open to these fun and easy projects in the future, they're a nice break and the finished quilts are great to have on hand when wanting to decorate the house for a special theme. 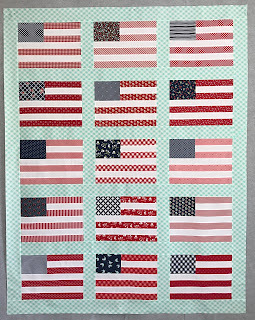 Sunkissed - #204 - This quilt looks much better in person, sometimes it's just the right fabric for the right pattern that makes a quilt special, that's the case with this one. My Jen Kingwell finish also has to make my top 5 list. Long Time Gone # 216. I went with colors that were outside my comfort zone but think it all worked out fine in the end. 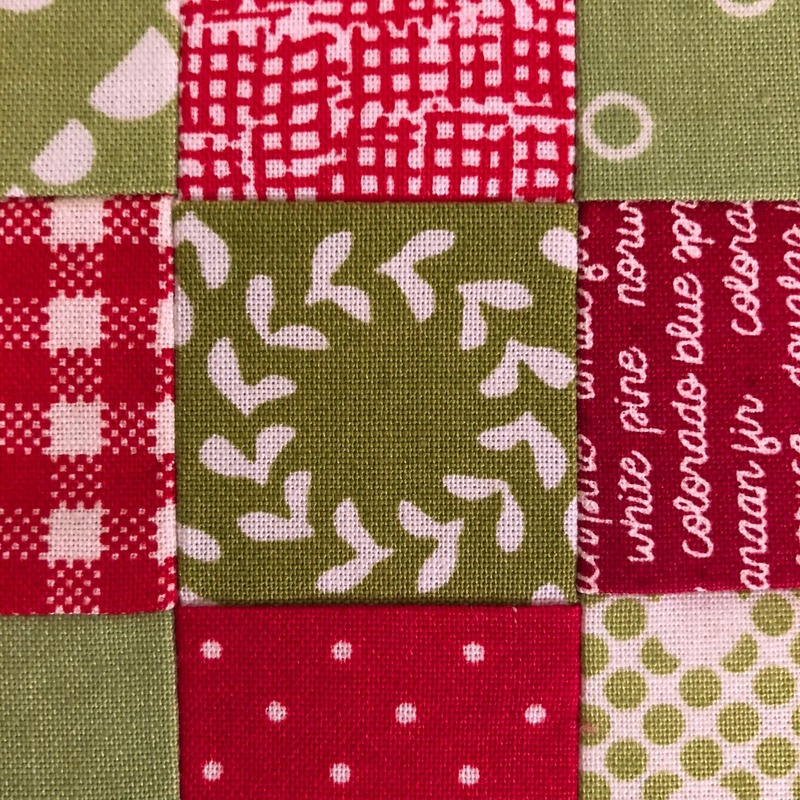 And even though I struggled with my fabric choices I loved piecing each block. #200 - another quilt that had been on my to do list for too long. OK, so now I'm up to 6 top fives, lol, who can really pick a favorite, any finish should be a favorite. I busted open all my Bonnie and Camille bundles to create 9 blocks from my favorite fabrics. Then I splurged on a custom quilting job. This was another quilt that had been on my to do list for too long. 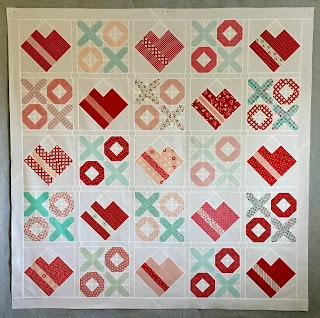 I've never met a Swoon quilt I didn't love, but I think I love mine most of all. All the quilts I made this year are listed on my Second 100 tab with pictures and details. Start with Village, #193 and end with Falalala Lucy #218. Today is the last day of the Year of Thelma, it has been a wonderful year, and as is the case with most years, I'm sad to see it end. Since it was my special birthday year I gave myself permission to say yes to things I would normally say no to, and no to things that I just didn't want to do, all guilt free. As mothers, wives, sisters, and employees and employers, we naturally tend to put ourselves last, I may not always put myself first in 2018, but I won't be bringing up the rear at every turn either, I hope you can do the same. I'm still working on my 2018 goals, or as I like to think of them, guidelines. It's always the same old story, so many quilts, not near enough time. 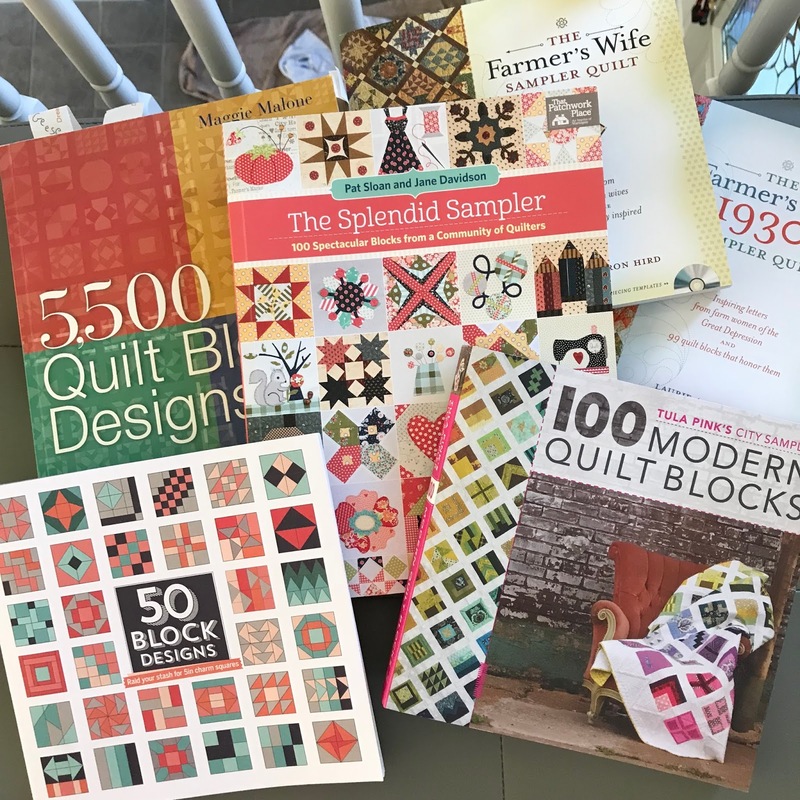 As I reflect on 2017 I am so thankful for the wonderful quilting community that supports and inspires me and makes me a happier and better quilter. Best wishes to you for all things wonderful in 2018, thanks for stopping by blog. All quilts are followed by my Lifetime Quilt #. For more detail on any quilt go to my Second 100 tab, all quilts are listed with links to details. Nothing like wrapping up the holiday season with a holiday finish. This is my third Lucy quilt but my first Falalala Lucy, the other two are Halloween Lucys. The reds and greens are just an assortment from my stash, some Christmas lines some not. 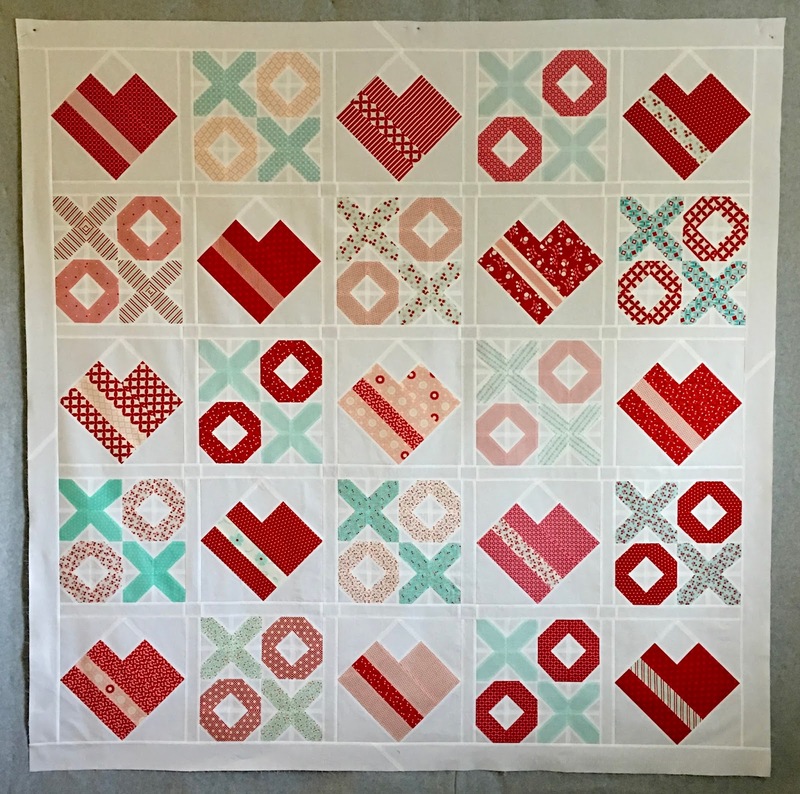 The red and white background fabric is from the Merrily line by Gingiber for Moda. I had a horrible time trying to get a good picture of this quilt, maybe the sun will shine again and I'll give it another shot. It's been so dreary here, I don't mind the cold or snow, but the days of no sunshine are depressing. The pattern is Lucy from the book Miss Rosie's Farmhouse Favorites. It finished at 76" x76"
And this is just a little happy accident that made my day. As I was reviewing my finishes for 2017 I noticed that I forgot to blog about this finish. 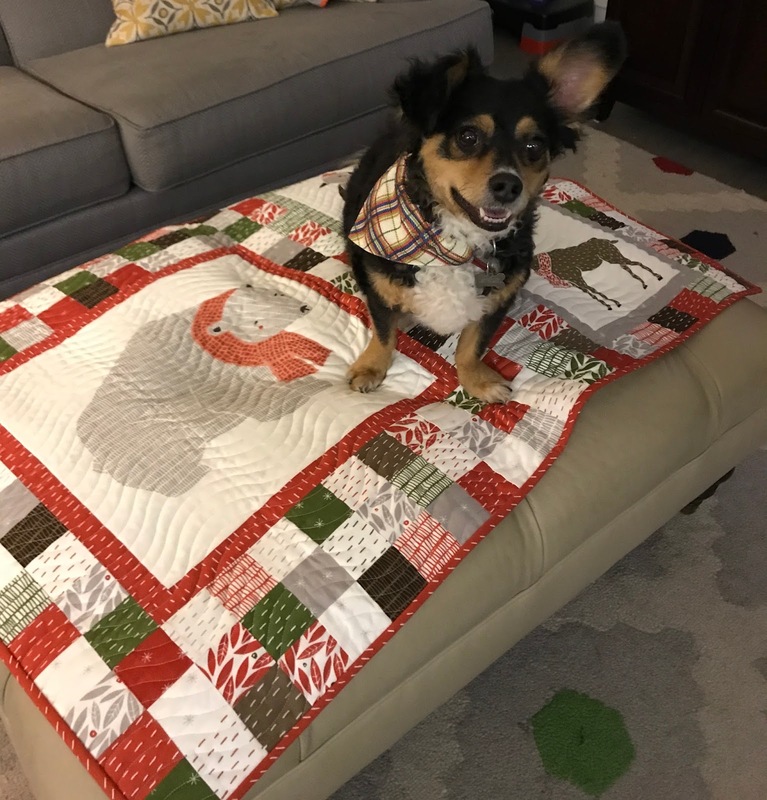 I had some leftover pieces from my Merrily donation quilt and whipped up this little quilt for my favorite California Pup-pup. 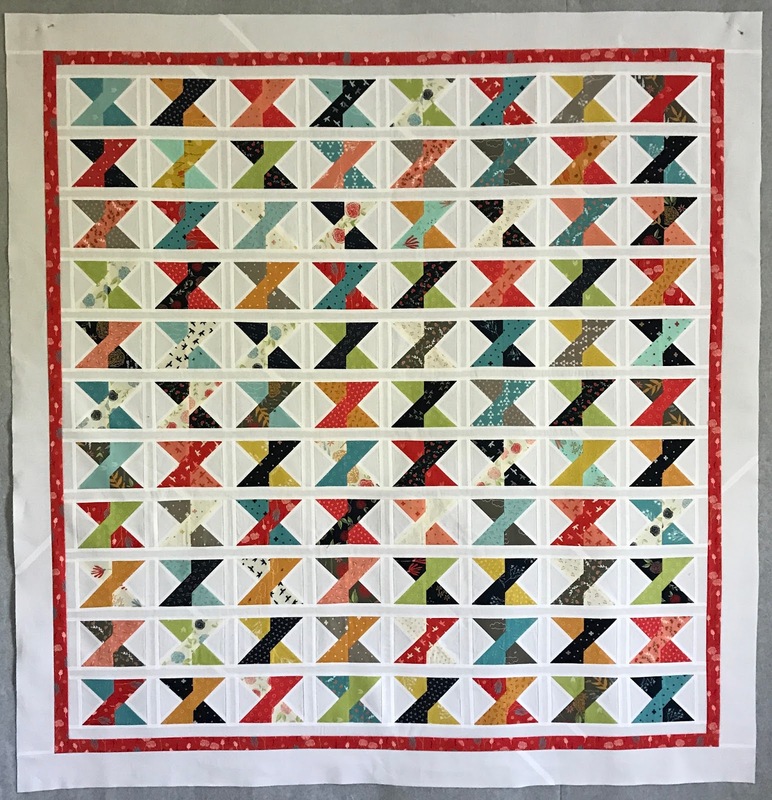 It finished at 42" x 30"
I'm still updating my blog to match my 2017 sewing life and I have no idea how I almost missed blogging about this quilt, one of my favorites for 2017. 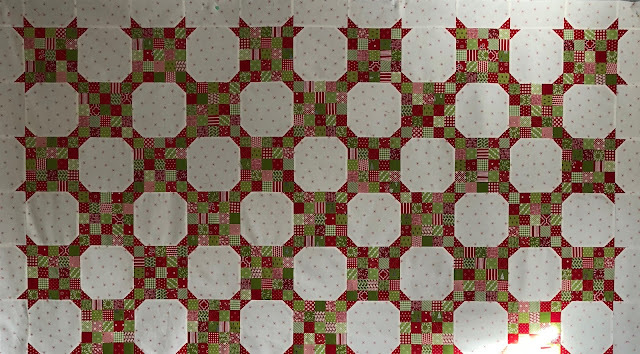 So one of my Year of Thelma goals was to piece a 100 block sampler made up of 6" blocks. 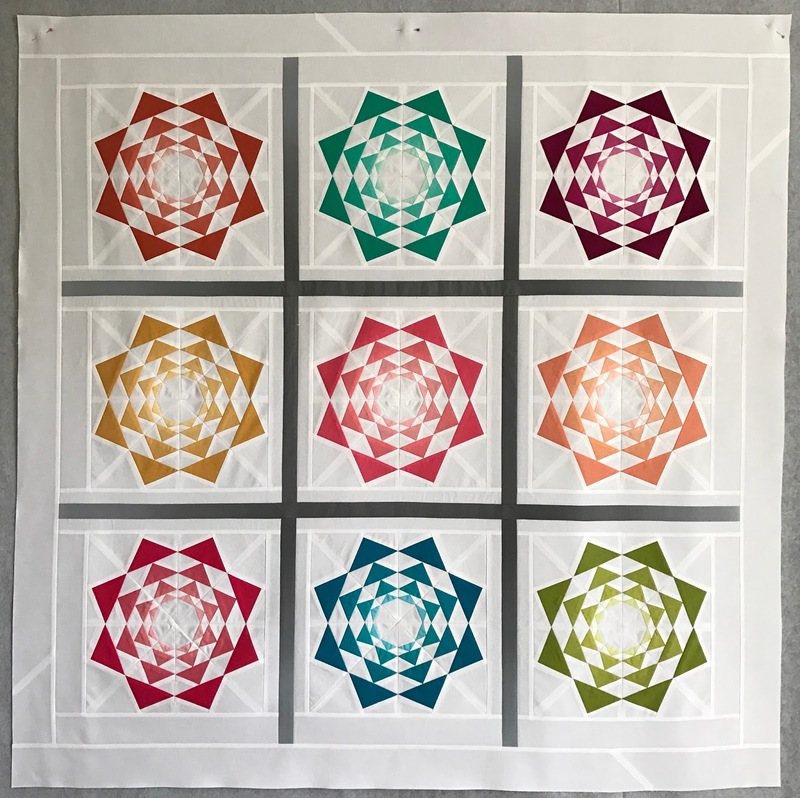 Here's a little something I've learned over the last few years, no one has enough time to make all the quilts they want to make, so in order to get through my long to do list I combine quilt patterns when possible. That's what I did with my 6" sampler quilt. I don't have enough time to make every sampler out there, so I decided to piece my favorite blocks from all my books. And to add to the fun I "graded" each block after I pieced it. 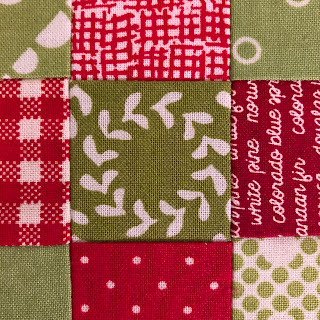 1 was a perfect block, perfect execution, great pattern and lovely fabric selection for that pattern. 2 was almost perfect, I just missed one of the criteria from 1. 3 was missing two of the perfect 1 criteria. 4's were total misses. As I pieced my blocks I put them on my design wall under its corresponding grade. When I was done I had mostly 1 blocks, hurrah, and I only managed one total miss. There were a few 3s but I didn't get a picture of them, and some 3s did make it into my finished quilt. 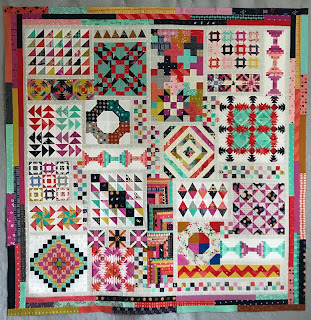 Once the blocks were pieced I actually loved them all and I couldn't remember why I sometimes gave a block a grade of 2 or 3. To finish things off I just added some sashing and floating cornerstones for a simple yet perfect for my taste setting. It finished at 85" x 85"
It has approximately 2,081 pieces. 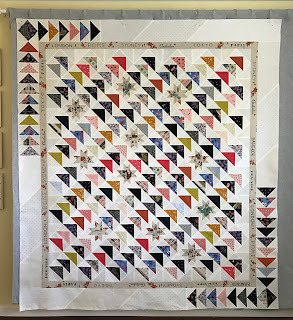 Do you remember when I made my Due South quilt earlier this year? It was a Miss Rosie quilt pattern that had been on my to do list for ages. 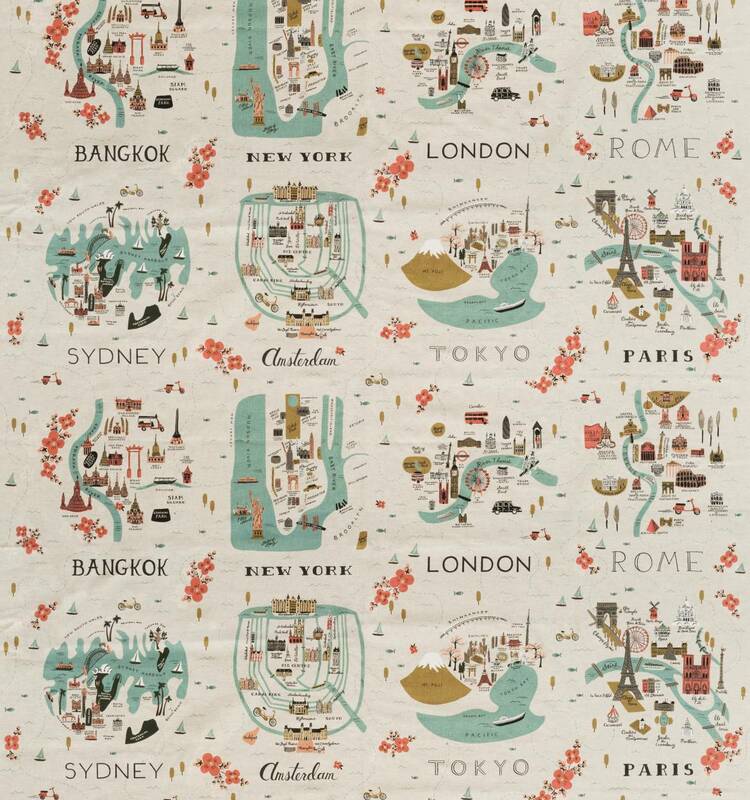 I loved the Rifle Paper Co map print fabric that I used, but was a little sad at how much of the personality of the fabric that was lost when I cut it into little pieces for those stars. 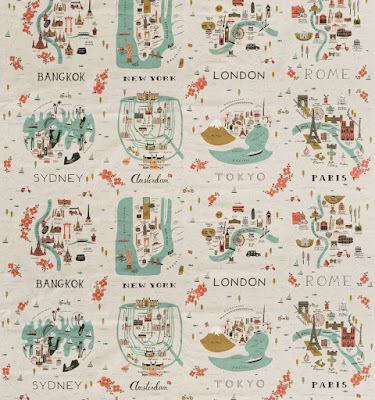 When my daughter commented that she also loved that map print I thought it was a great chance to work with that fabric again, and maybe do a better job at putting the focus on each city's cute drawings. I've named it Let's Go - because the quilt was a Christmas gift for my daughter and she's my travel partner, and I'm always ready to go anywhere when she's available. It finished at 77" x77"
It has approximately 596 pieces. I finished the quilt earlier this year but didn't post on social media because it was a surprise gift for my daughter. She loved the top and I think she'll love it more once it's quilted and at her house for good. I'm playing catchup on my blog, I finished Long Time Gone in November but am just now getting around to blogging about it. Mainly because I needed to count the pieces in this finished project, it sure would have been easier to count them as I made each block, lol. Since I have a Year of Thelma goal of no unfinished projects I needed to wrap this one up. 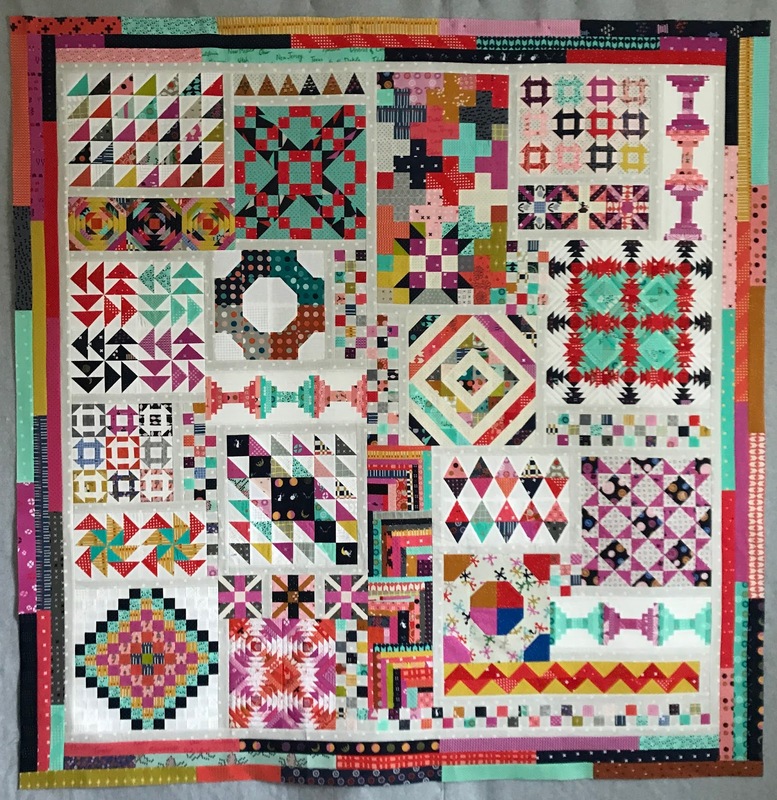 Here are all the pieced blocks. If you look at the quilt on the pattern cover you may think this project is overwhelming, but it is not. Each block is fun and easy to piece, and the sections go together perfectly. You just take it a block at a time and then one section at a time. 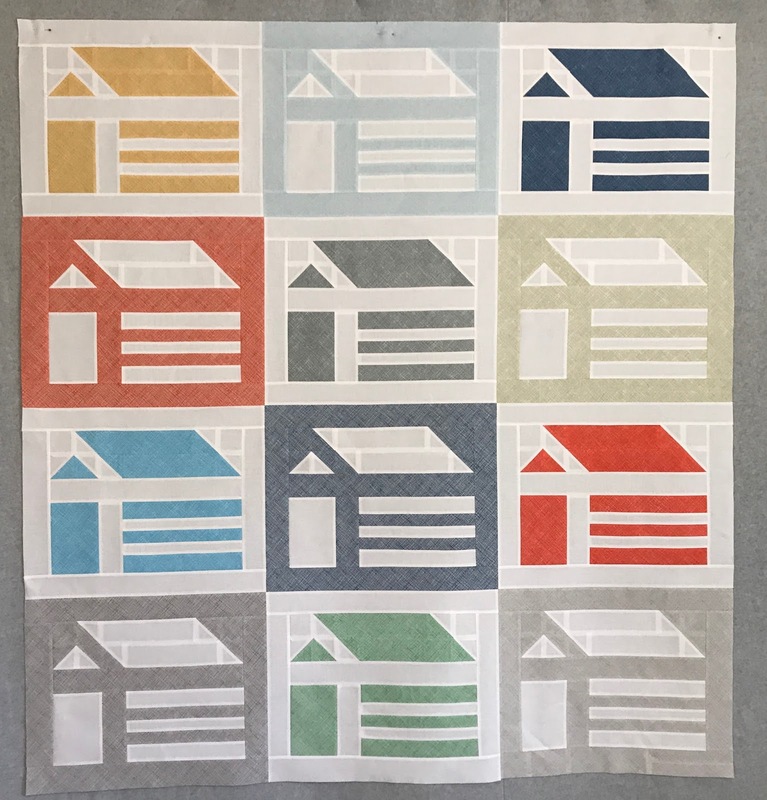 Here are all the sections connected, I really loved the simple look of the light grey sashing and border and almost stopped there. But then I decided to add the outer borders, and am glad I did, even if it did take me a couple of days to warm up to the bolder look. It finished at 67" x 68"
And while I think this quilt is a beauty from a distance, it has more charm up close. Here are a few pics of my favorite novelty prints hiding in those blocks. I studied the pattern book on a weekend getaway and had a good understanding of all the components before I started. 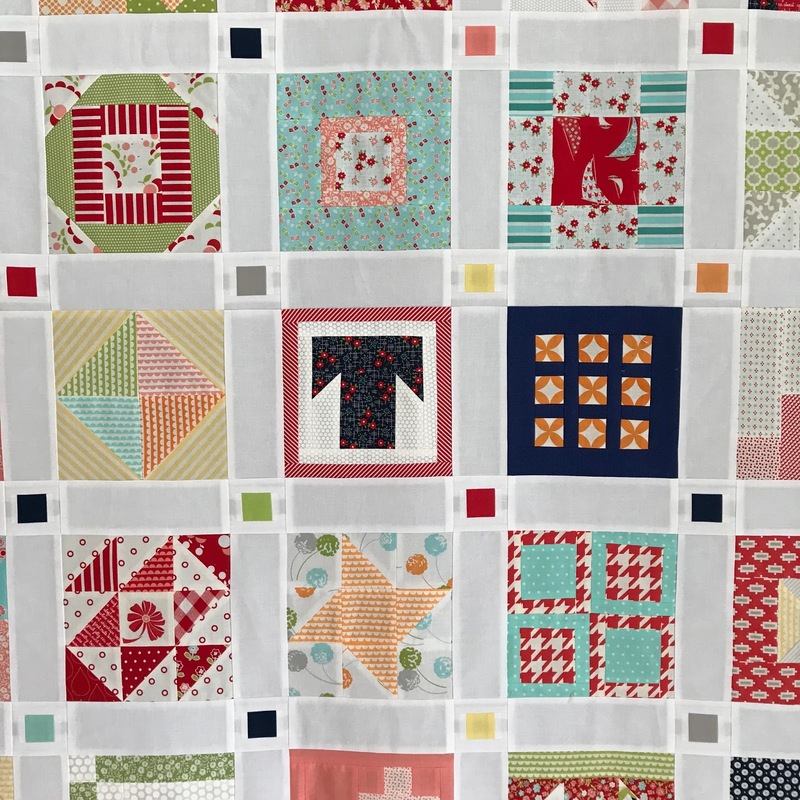 After I selected my fabric, mainly fat quarters, (I think I used pieces of around 60) I cut varying strip widths based on the needs of the majority of the blocks and the outer border all at once. When it was time to piece a block I just selected my fabric from the appropriate strips that I stored separately on large baking sheets by width. I also cut the sashing checkerboard squares as I went, from scraps. I think this helped move things along at a nice pace. 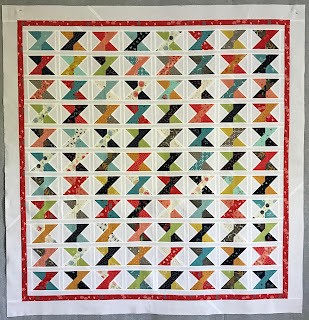 I enjoyed this project so much I think I may have to add Jen's 2017 BOM pattern, Baker's Dozen, to my 2018 To Do List. I'm so excited to blog about my latest finish, it checks off several boxes on my 2017 Year of Thelma list. 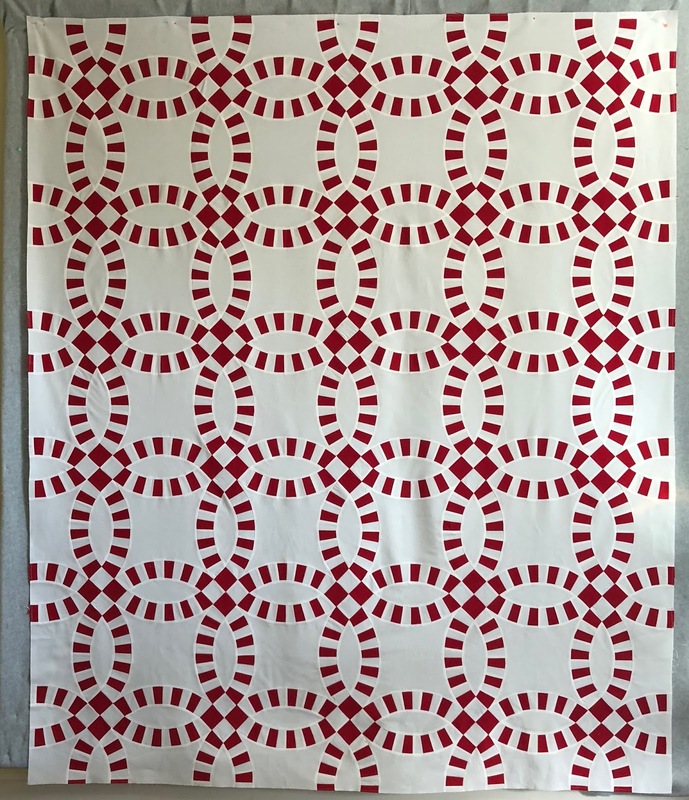 First, because it's a red and white quilt, second, because it's the last unfinished project in my sewing closet, and finally, and most importantly, I finally pieced a Double Wedding Ring Quilt. Before I started on this adventure I asked a few of my quilting friends what method, book, templates they used to piece their DWR quilts. For every person I asked I got a different preferred method. 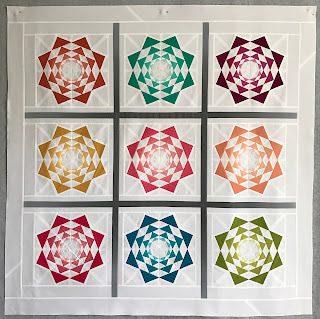 Now this could have made me feel overwhelmed but instead made me think, "there must not be a wrong way to make this quilt". So with that in mind I chose this book, and I think I chose wisely. 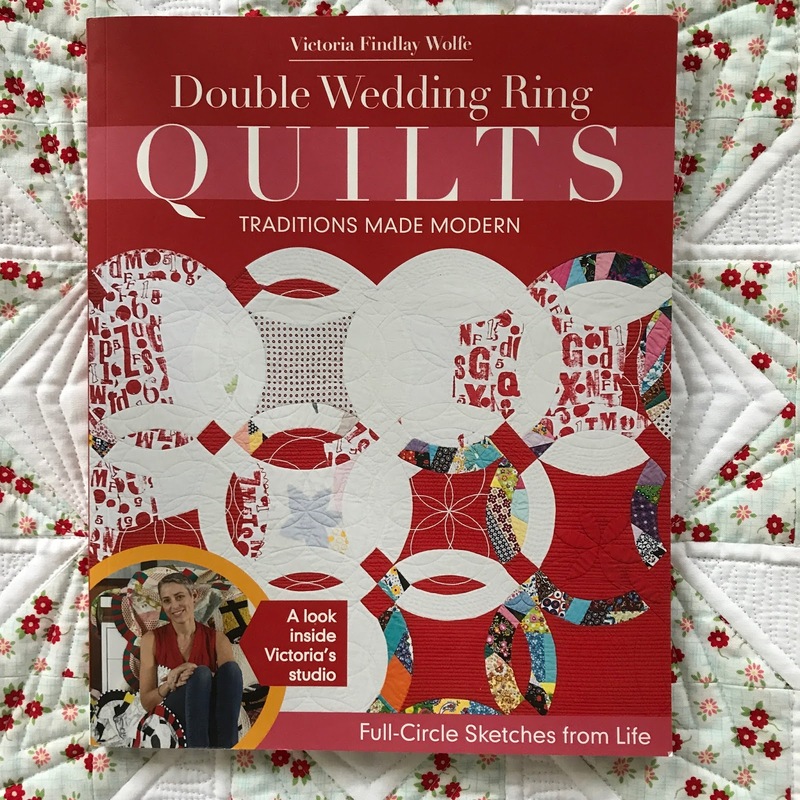 Double Wedding Ring Quilts, Traditions Made Modern by Victoria Findlay Wolfe. Everything I never knew I needed to know I learned from this book. This book provides paper templates but Victoria also offers acrylic templates for sale that correspond to the patterns in this book. She also has online videos that explain all the steps. I used it all. And don't let that "modern" in the title make you think this book is only for modern quilts, the quilt I made is as traditional as they come, I've seen this pattern in quilts over a hundred years old. To piece the arcs I copied and used the paper template from the book, but to trim the pieced arcs I used the acrylic template. The only pieces of my quilt that were paper pieced were the arcs. I used a template to cut the arc centers. And a template to cut the background pieces. Using those pieces I made some blocks. They went together easily, I highly recommend using the acrylic templates. I pressed my seams to the side and left the paper on the back of my arcs. And here are all the pieces on my design wall. Once the rows were connected I removed the paper from the arcs, pressed the seams in the direction that they wanted to go, and squared it up. And here is my finished, first, but not last, Double Wedding Ring Quilt. It finished at 71" x 86"
The pattern is from the book Double Wedding Ring Quilts, Traditions Made Modern. It has approximately 1,498 pieces. As of today there are only 20 days left in The Year of Thelma. 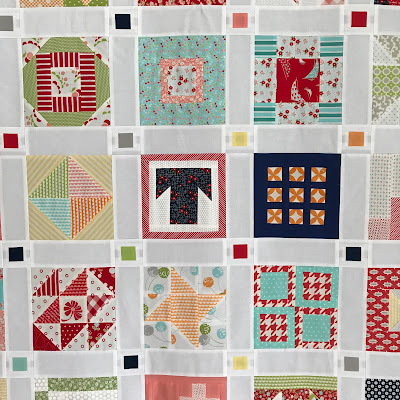 Calling all quilters who joined the YoT sew along by piecing a top from the Miss Rosie's Farmhouse Book. The top just needs to be pieced to make the parade, don't worry if it's not quilted! 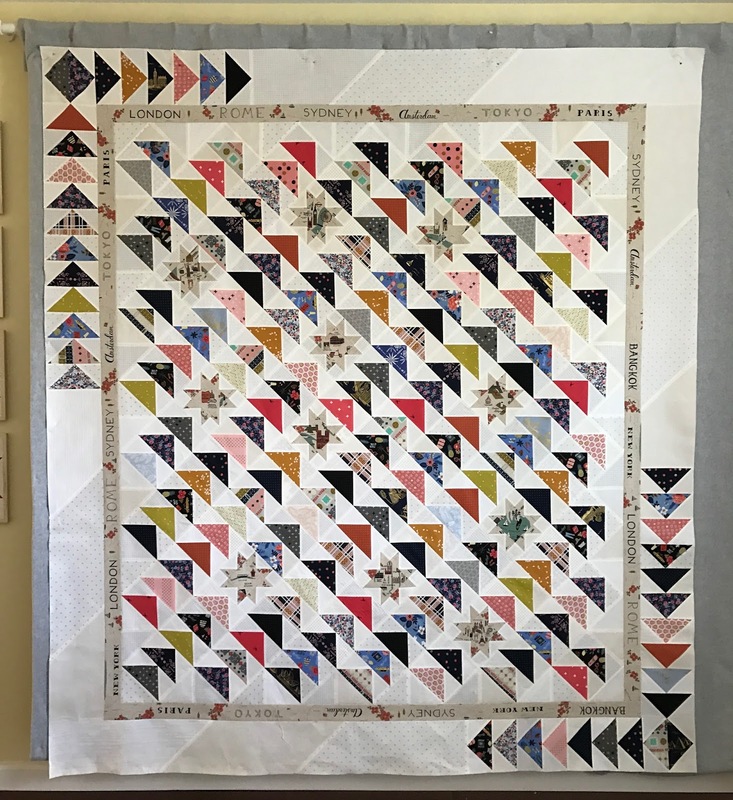 I've made two quilts from the book this year, Due South and Halloween Lucy. I plan to wrap up the year piecing a 3rd, Falalalala Lucy! It's not too late to join the fun.